Emirates SkyCargo, the freight division of Emirates airline and a leading force in the industry drive towards e-freight, has marked a milestone with its inaugural paperless flight between Nairobi and Amsterdam, the Netherlands. EK9952 which left Nairobi for Amsterdam on March 27th became the first flight out of Nairobi with shipments processed electronically. The Boeing 747 freighter carried 103.884 tonnes of cut flowers to Amsterdam, the main market for Kenyan flowers. Speaking in Nairobi, Emirates Airline Cargo Manager for East Africa Khalid Al Hinai emphasized the significance of this achievement and Emirates’ leadership role in spearheading the e-freight agenda both regionally and globally. “It is with great pride that we are celebrating our first e-freight flight out of Nairobi. This is the first time a full freighter had been attempted and achieved successfully and marks a significant step towards working in a completely electronic environment, which will bring enhanced operational efficiency to the supply chain,” said Al Hinai. E-freight is a collective cargo industry initiative facilitated by The International Air Transport Association, IATA, with the goal of removing all paper Air Waybills, as well as every other document and certificate, by the end of 2014. Mr. Al Hinai said the adoption of the e-freighting system will help the airline streamline processes, increase speed and reduce costs. IATA has estimated that about US$4.9 billion of industry savings could be generated and about 7,800 tonnes of paper documents eliminated annually using the e-freight corridor. “We totally support this initiative and firmly believe e-freight will become the industry standard and those who embrace the changes first will be best placed to reap those benefits which also include improved reliability, increased accuracy and, of course, bring environmental benefits,” said Al Hinai. The successful Nairobi e-freight flight to Amsterdam follows a successful paperless flight to Mauritius late 2010 and is an indication of Emirates’ determination to meet the AITA 2014 target. 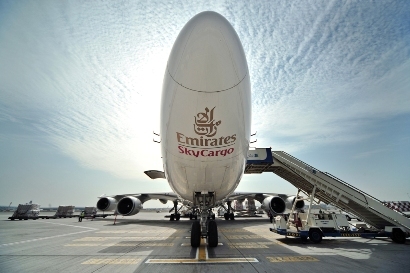 Emirates SkyCargo operates dedicated freighter aircrafts between Dubai and Nairobi route three times a week in addition to the belly hold capacity of the 14 weekly flights out of Nairobi. Out of Nairobi Emirates SkyCargo carries cut flowers and other horticultural products, meat, among other products. It brings in pharmaceuticals, telecom equipment, textile products, electronic product, etc. Emirates’ 152-strong fleet including seven freighters (three Boeing 747-400Fs, two 747-400ERFs and two 777Fs) is one of the youngest in the skies and now serves 109 destinations in 65 countries on six continents. In 2010, the carrier won a clutch of awards: ‘Cargo Airline of the Year’, ‘Best Cargo Airline to the Middle East’ and ‘Best All Cargo Airline’ at the prestigious Cargo Airline of the Year Awards 2009 from Air Cargo News. It was bestowed the Gold Award at the Annual Air Cargo Excellence Awards at the IATA World Cargo Symposium.